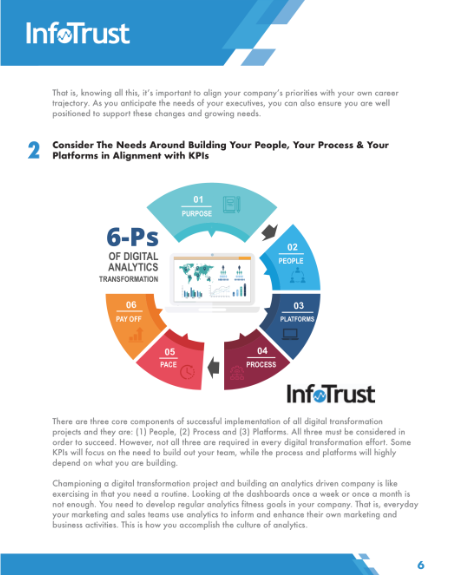 In this white paper, Michael Loban, CMO of InfoTrust, outlines how you can catapult your career through strategic alignment with your company's digital transformation project. Companies are committed to forging ahead with digital transformation projects despite an ever widening gap in the very people who can lead this charge. As Iʼll show in this white paper, if you understand and mitigate the risks, align the needs of your senior executives and build your team correctly, you have right in front of you an incredible opportunity to advance your career. Fill out the form and start working towards your next promotion today!